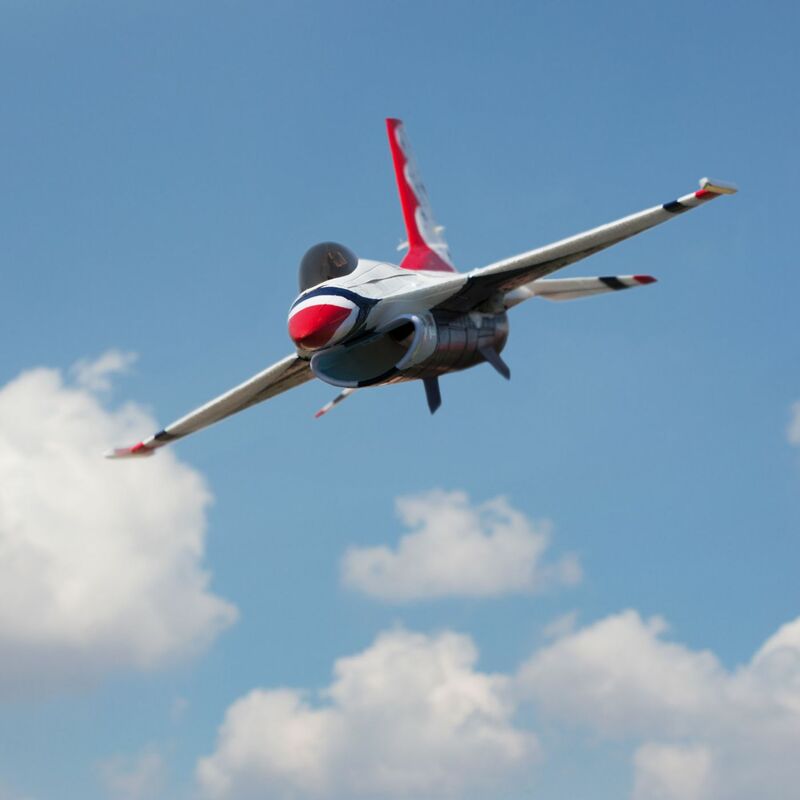 The United States Air Force Thunderbirds demonstration team has been inspiring aviation fans since the very start of the jet age. Going into a 33 year run, the incredible Lockheed Martin F-16 Fighting Falcon multi-role jet platform has been an exemplary part of the precision and dedication for which the team is known. 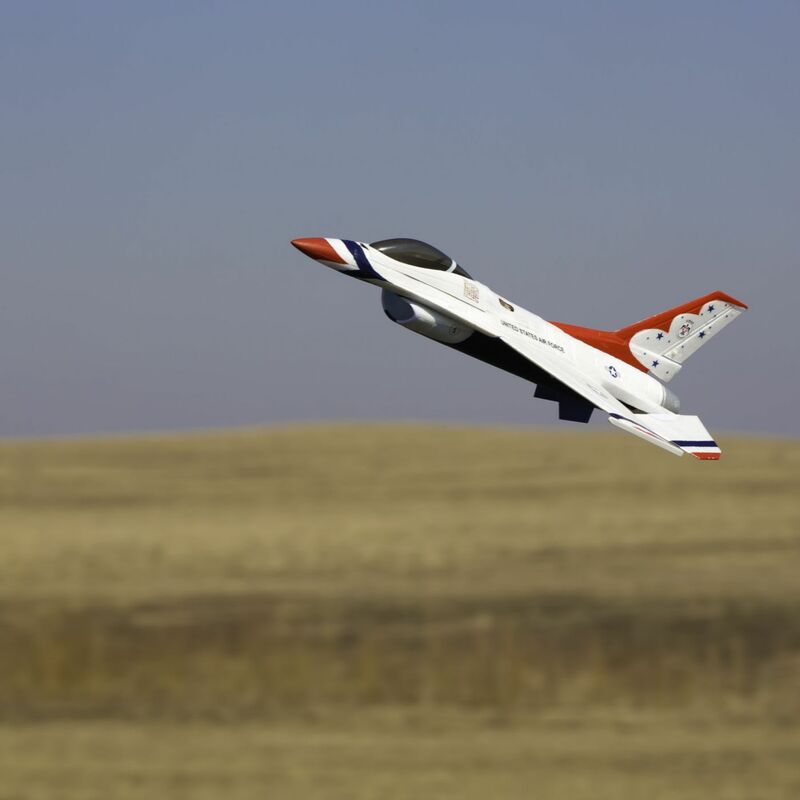 The E-flite® UMX™ F-16 EDF jet is inspired by the engineering and world-renowned service record of the original by offering the excitement of a great flying RC jet you can enjoy just about anywhere. You’ll enjoy four-channel precision with an operational rudder and full-flying horizontal stabilizers that provide both pitch and roll control. A steerable nose wheel helps you maneuver on the ground so that you can keep the air show going from startup to shut down. In the air, innovative AS3X® technology makes this show stopping EDF perform as if you’re at the controls of jet that’s been expertly tuned. 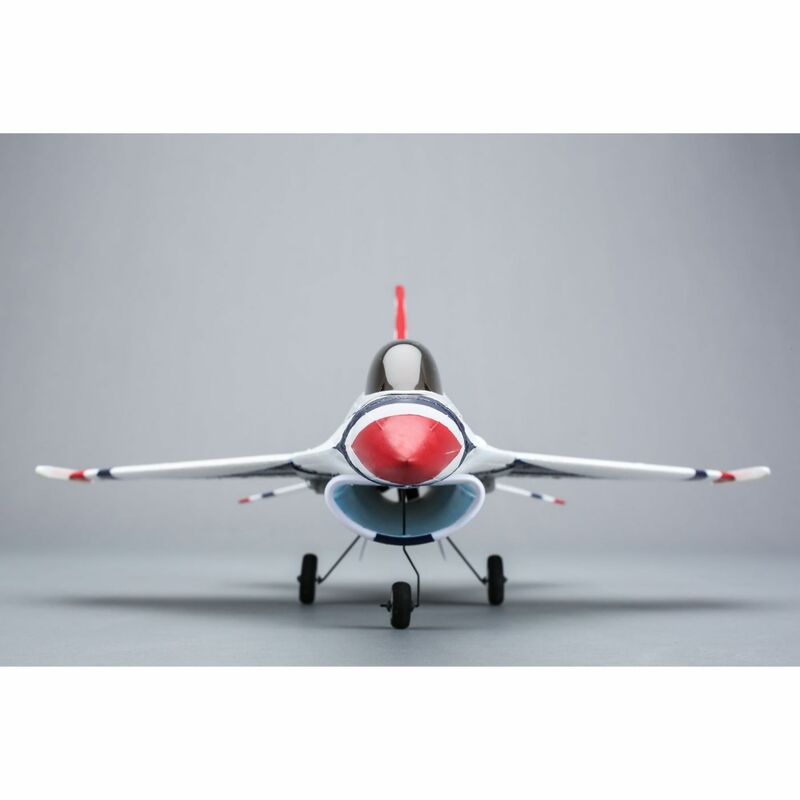 All you need to fly the UMX F-16 EDF right away is a 6+ channel transmitter with Spektrum DSM2®/DSMX® 2.4GHz technology that’s capable of dual rates and expo, 280mAh 2S 7.4V Li-Po battery (EFLB2802S30 recommended) and a suitable charger. 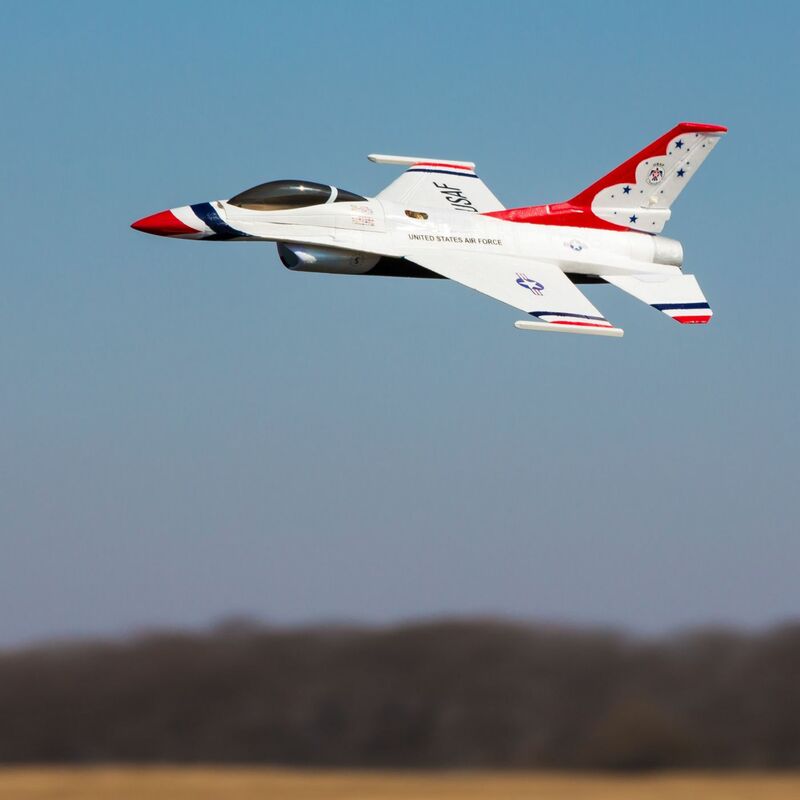 The advanced AS3X® (Artificial Stabilization – 3-aXis) system built into the Spektrum™ 6-channel ultra micro receiver is what helps give the E-flite® UMX™ F-16 jet an incredibly solid look and feel in the air. It’s technology that works behind the scenes to help counter the effects of wind and turbulence by combining 3-axis sensing with exclusively tuned flight control software. As a result, your workload to fly smoothly is significantly reduced while control feel is always rock-solid so you can make your maneuvers look great. It’s an impressive flight experience that will have you feeling like you’re at the controls of an expertly-tuned jet that’s much larger. 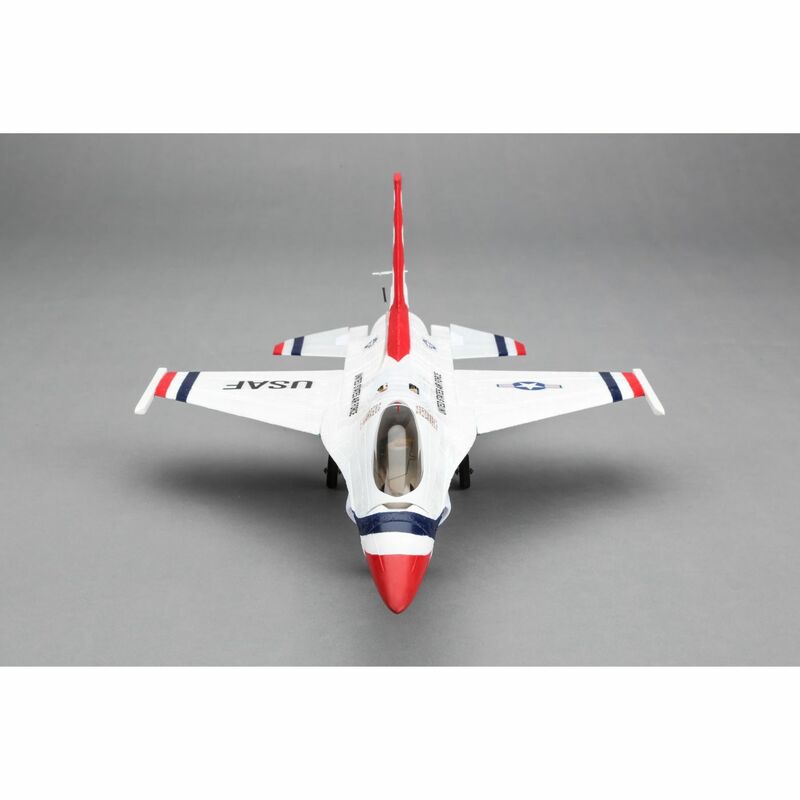 The UMX™ F-16 is officially licensed by Lockheed Martin and is a near 1/32nd scale replica of the Fighting Falcon with a trim scheme inspired by the United States Air Force Thunderbirds precision aerobatics show team. Full-flying horizontal stabilizers provide highly-effective pitch and roll control and a lightweight setup that still provides 4-channel functionality. The installed E-flite® Delta-V 180m EDF ducted fan system is tuned with a new 13500Kv motor to deliver smooth power. When combined with the engineered ducting of the UMX F-16, you get a thrilling jet experience that can be enjoyed just about anywhere. 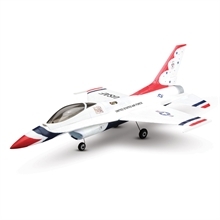 The lightweight landing gear setup features nose wheel steering that allows you to guide your UMX F-16 on smooth runways. The wire struts simply plug-in, so they can be easily removed for faster flight performance. Because the UMX F-16 comes out of the box fully assembled, all you have to do is charge the recommended 280mAh 2S 7.4V Li-Po (EFLB2802S30) battery, bind the jet to your 6-channel computer radio equipped with genuine Spektrum™ 2.4GHz DSMX technology and fly.